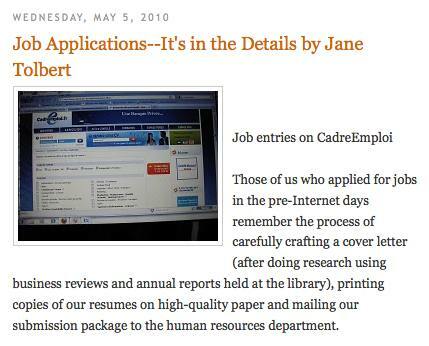 Jane Tolbert’s post “Job Applications — It’s in the Details” is a good read for anyone who is getting ready to enter the job market or for those of us who are teaching “how to apply for a job” to our students. Jane taught with me when she was a doctoral student at UF. That would have been in the time, as she describes in her blog post, of resumes (or curriculum vitaes, in the academic world) printed on cotton paper (with a watermark) and then mailed (with a stamp). Jane recounts her application process now, which typically has been done online — with varying degrees of success and frustration. One of the first assignments in Writing for Mass Media, a course I teach, is for the students to write a resume and a cover letter, targeting a specific media-related internship or job. Specifics of that assignment have changed in the last few years to reflect the application realities that Jane discusses. Like Jane’s experience, most students find that the application is to be submitted online, either as an e-mail attachment or uploaded to an application database. The URL or e-mail address is what is needed, not a mailing address. Fewer and fewer jobs have someone to actually apply to. Most applications are going to a human resources office or internship coordinator — but no name is provided. The cover letter now is an e-mail. So we discuss the importance of writing a professional e-mail, in contrast to the e-mail style the students are used to writing. They often don’t capitalize or break the e-mail into paragraphs and don’t check for spelling or grammatical accuracy. Developing a resume with graphic design pizzazz isn’t needed for most applications, as the resume is uploaded in pieces into an application template or is copied and pasted into an e-mail. If the resume can be attached to the e-mail, it should be saved as a PDF and not sent as an InDesign document or some other format that the recipient may not be able to open. Whereas before, the main changes for sending an application from one business to the next often were to make sure the business address and salutation were correct for the business. The cover letter or resume may have required some adjusting to customize it for the specific job or internship. But now every organization and business has its own submission guidelines, and it’s essential to follow those guidelines. So as Jane writes, those submission details are part of the application process to avoid those error messages.